Multi-point (1…5) calibration for more linearity. Selectable resolution from 0.001pH to 0.1 pH. Automatic calibration with any of nine pre-programmed and five user specified pH buffers. Accepts pH electrodes with any zero point (Eo) between ±999 mV. Features mV calibration for accurate ORP measurements. Selectable resolution from 0.1 mV to 1 mV. Ion mode is easily calibrated with any 2...5 standards and a blank correction. Useable with Ion Selective Electrodes like F , Cl , NO3,NH3, NH4, Br-, I-, CN-, Ca++ etc. Multi-point (1…3) calibration for more linearity. Extended conductivity range; to measure the full range from 0.001 μS/cm to 2000 mS/cm requires 3 electrodes: 0.1, 1 and 10 cm-1. Selectable reference temperature: 20° or 25°C. Automatically selects correct range and frequency. Automatic cell constant determination with any of three preprogrammed or user specified standard tables. Allows to lock the initial conductivity range to avoid nonlinear titration curves. Accurate low conductivity measurements by eliminating the capacitive component of the electrode and its cable(avoid the use of long cables!). Operates with a galvanic dissolved oxygen electrode requiring no polarisation time and no zero calibration. Selectable resolution from 0.01 mg/l (0.1%) to 0.1 mg/l (1%). Manual salinity compensation 0-40 ppt. Automatic air pressure compensation 600-1300 hPa. Reads temperatures with 0.1°C resolution. Manual or automatic temperature compensation (O2, 0…50°C) . Calibrates temperature probe for quality measurements. Two BNC inputs for pH, mV, Ion, dissolved oxygen or conductivity. Low voltage DC input for e.g. a mains adaptor. USB interface for connection to a computer. RS232 interface for connection to a printer or computer. Stores up to 12000 values including temperature, time and date. Allows to mix data from all ranges in the same table. A powerful data acquisition software for PC is available optionally. Robust dust and splash-proof cabinet. An optional wall mounting kit allows to fix the meter to any wall making more space available on the desk. No electrical interference between electrodes in the same solution. Two-way communication with a printer or computer using RS232 or USB. 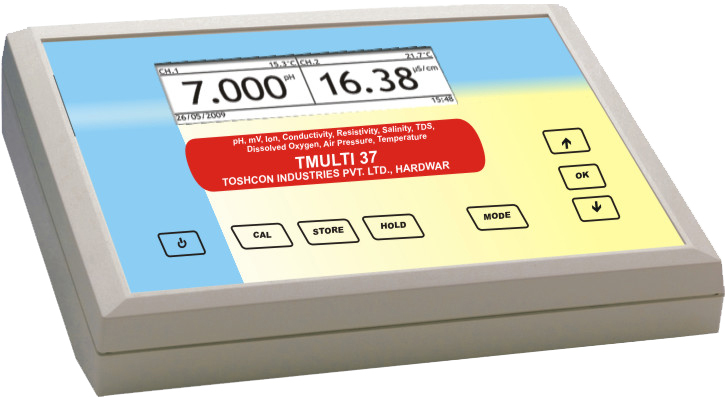 Can be programmed to continue automatically with the measurements or data-logging after a power failure. Password protection prevents any unauthorised access to the instrument. All procedures for a “Good Laboratory Practice” are on board.